The reason J, L, and I headed to Chicago this week was to surprise J’s grandma. The family had set up a ruse to get her to a restaurant near her house for a surprise birthday party. J was the bait. The family told grandma that we were in town and on our way either to or from my parents and we wanted to meet up with her for dinner. The plan worked. She was surprised. The restaurant chosen for this surprise party was Fox’s on Wolf in Mokena, IL. I’m not really sure how or if all the other Fox’s restaurants on the South Side are related. 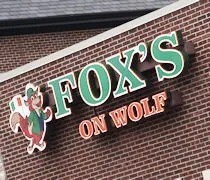 There are two different websites linking the Wolf Road location to the Orland Park location. The other website links the Oak Lawn, Plainfield, and Beverly locations. 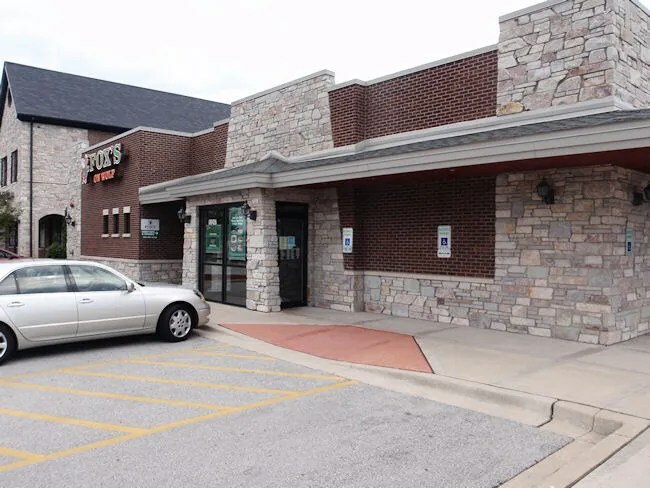 Anway, the Mokena location where we ate at is on 187th Street just to the west of Wolf Road. The building looks fairly new and as you would expect on the Southside, has an Irish feel to it. We all met in the large bar area to start with drinks about a half hour before Grandma was supposed to arrive. The tap selection is a little weak so I ended up with a Leinenkugel Summer Shandy which isn’t my favorite beer, but it was the best selection they had. J stuck with Iced Tea while the rest of the group was pretty split between the Summer Shandy, Miller Lite and Coors Light with a few glasses of wine mixed in. For the most part, everyone had pizza. At some point, someone had ordered several pizzas and that’s what most folks wanted. I managed to grab one slice of the super thin, golden brown pepperoni pizza. It was actually quite delicious with a slightly greasy top of well done cheese. The pizza flew off the tables pretty fast so I am really glad that I ordered something else. J, her mom, and I were the only ones to order sandwiches. I ordered a burger (my second of the day) called The Highwayman. 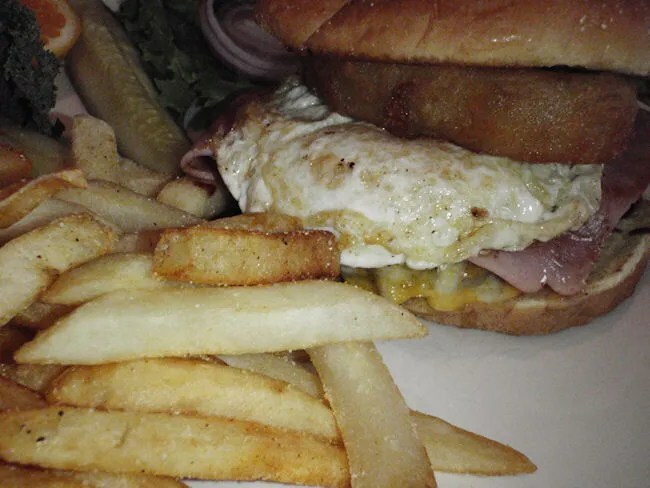 The angus beef patty is topped with Mozzarella cheese, cheddar cheese, ham, BBQ sauce, an onion ring, and a fried egg. The burger was very good and very messy. The bun didn’t stand a chance from all the grease. It disintegrated to the point that I needed to pick up a knife and fork. As much as this was supposed to be a “use your hands” sandwich, there was no way after a few bites. The meat was sliding off the bun and it all just fell apart. The fries were a little on the salty side and a little on the limp side. A couple of them were pretty undercooked. I was getting pretty full anyway as I had just eaten about two hours prior to this meal. J ordered The Turkey Avocado Ranch Panini. The Rustic Italian bread comes with smoked turkey breast, romaine, tomatoes, avocado, and home made ranch dressing. 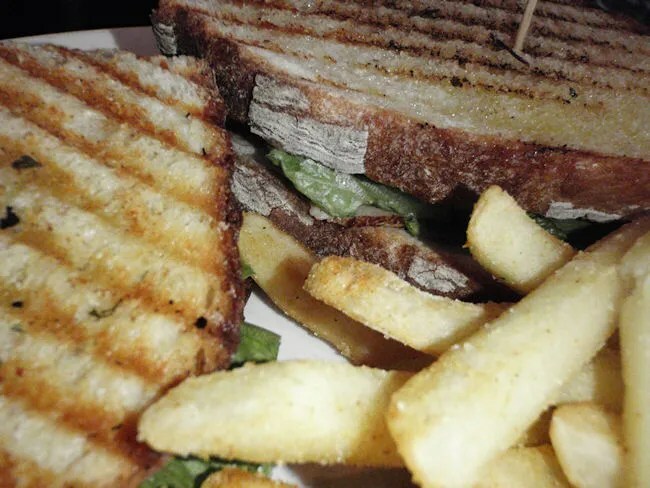 Her sandwich didn’t come with fries, but she added an order to the plate. We actually didn’t talk much about the meal because we were starting to deal with a cranky baby towards the end. We were both in hurry up mode trying to prevent a melt down. I did notice her sandwich was gone when the plate was taken back to the kitchen, but there were quite a few of the fries left. J’s mom ordered the Irish Reuben. This not quite a sandwich is dark rye bread with corned beef, sauerkraut, and Swiss cheese. She also added on fries to her plate. Again, not much discussion about dinner, but as is custome for her, she boxed up half of this knife-and-fork sandwich to take home for later. Obviously, I never saw a bill for this party and it’s really none of my business. We were home for Grandma’s birthday and that was what was importat. She had a huge smile on her face the rest of the night. Fox’s on Wolf is a pretty solid Irish pub in the Chicago suburbs. They’re known for their pizza, but the sandwiches were pretty good as well.